Cut licorice into 3 inch sections. Working with one or two cupcakes at a time, so the frosting doesn’t set before decorating, frost the cupcakes with the white frosting. Insert licorice pieces into the outer edges of the cupcakes to make the legs of the spider, 3 legs on each side (4 takes up too much space). 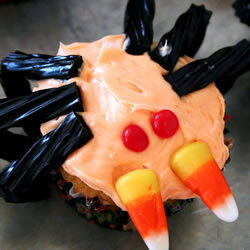 Place two pieces of candy corn on the front of the cupcake for fangs and use two red hots as eyes. Sprinkle with decorator sugar. Repeat with remaining cupcakes. In a large bowl, mix together flour, sugar, baking soda, baking powder, salt and margarine. Stir in 1 cup of buttermilk and egg. Turn dough out onto a lightly floured surface and knead slightly. 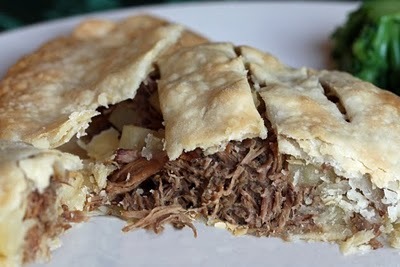 Form dough into a round and place on prepared baking sheet. In a small bowl, combine melted butter with 1/4 cup buttermilk; brush loaf with this mixture. Use a sharp knife to slice an ‘X’ into the top of the loaf. Bake in preheated oven until a toothpick inserted into the center of the loaf comes out clean, 45 to 50 minutes. Check bread to see if it is done after 30 minutes. You can brush the loaf with the butter mixture while it bakes. 1. Preheat oven to 375 degrees F. Unroll all 12 breadsticks from package. Cut each into 3 equal strips. Take 3 strips, one at a time and wrap around 1 hot dog starting from the top of the hot dog. (Each hot dog has 3 thin breadstick strips around it). Leave a small space towards the top of the hotdog to make mustard eyes. Continue wrapping all dogs then place on a lightly greased baking sheet. Bake for 10-15 minutes or until lightly golden brown. 2. Remove and let cool for 5 minutes. Use mustard or ketchup for the eyes. Heat oven to 375 degrees F. Unroll both cans of the dough; separate into 16 triangles. Cut each triangle lengthwise into 3 narrow triangles. Place sausage on shortest side of each triangle. Roll up each, starting at shortest side of triangle and rolling to opposite point; place point side down on 2 ungreased cookie sheets.